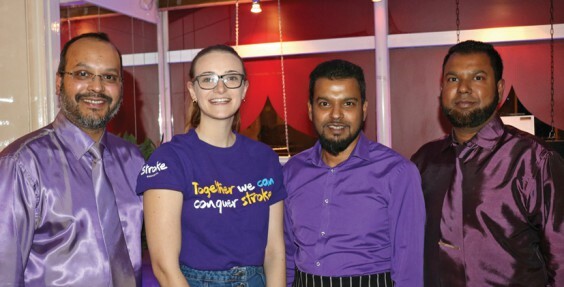 Spice Valley Balti in Bromsgrove will host a special fundraising dinner on Monday January 29, to raise money for the Stroke Association in Bromsgrove. Guests, who are asked to wear something purple, will enjoy a three-course meal with coffee and mints. Live entertainment is planned, plus a raffle with plenty of great prizes. Tickets are £20 and all profits from the event will be donated to the charity. 100,000 strokes happen in the UK each year, and there are more than 1.2 million stroke survivors. The Stroke Association is the UK’s leading charity dedicated to conquering stroke. Their mission is to prevent stroke and achieve life after stroke through support services, prevention campaigning, education and research. For stroke survivors in the West Midlands, the charity runs the UK’s only Life after Stroke Centre, based in Bromsgrove. At the centre survivors take part in activities, which aid recovery and provide social inclusion. Ruth Tandy, West Midlands’ Community and Events Fundraiser, said: “We are thrilled and incredibly grateful that the restaurant has chosen to raise money for the Stroke Association. SVB, on Worcester Road, was opened in 2000 by three brothers from the Uddin family – Gias, Monir and Muhammad. Eight family members now work at the award-winning restaurant. They raised £178 for the Stroke Association in October with event in celebration of the restaurant’s 17th anniversary in Bromsgrove. To book tickets for the Purple Charity Night please call 01527 578989.